The largest mountain in Washington's Washington's Cascade Mountains, Mount Rainier is a dormant volcano east of Tacoma. At a height of 14,411 feet, it is the highest peak in Washington and in the entire Cascade Mountain range. A crater near the summit still contains steam vents, which have melted snow and produce hollows and small caves that have sometimes sheltered climbers. 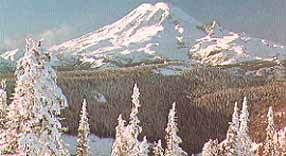 The mountain is the centerpiece of Mount Rainier National Park. Nearly two million people come to enjoy Mount Rainier every year.